Kanoff says the production was an enormous undertaking for the department. The script calls for multiple stage fights, in different styles. Since the play unfolds in both the real world and the fantasty world of the game, the technical team was challenged to show the transitions between the two. He notes that the rehearsal period included weekly stage practice, and began with three nights of role-playing games for the actors. 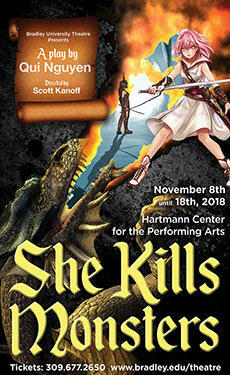 "She Kills Monsters" is now running at the Hartmann Center Theatre on the Bradley University campus. Performances continue through Sunday, November 18th. Scott Kanoff is the director of Bradley University Theatre's production of "She Kills Monsters." This week, we're talking with Newt Holt. He's the author and director of the new play, "Imprimatur," which runs next weekend at Eureka College. Set during World War II, the play tells the story of two cartoonists who go to work in the Office of War Information, and discover unpleasant truths about their own country. Holt talks about an earlier play, which he staged last year, and what he learned from that experience. He also talks about his dual roles as writer and director, and about the rewards of seeing his work brought to life by a company of actors. Caterpillar Employees Mixed Chorus Presents "Once Upon a Mattress"
Our guest this week is Jeff Craig, with the Caterpillar Employees Mixed Chorus. He's appearing as the Jester in their production of the musical, "Once Upon a Mattress." For 77 years, the Chorus has provided a musical outlet for CAT employees, retirees and dependants. In addition to a musical production each fall, the Chorus also has performances through the winter and spring. This week, we're talking with guitarist Jason Vieaux and conductor David Commanday. The Heartland Festival Orchestra presents a concert this weekend called "Guitar Classic." Vieaux is the featured soloist in a performance of Joaquin Rodrigo's "Fantasy for a Gentlemen," and in a contemporary piece called "Six Sixteen."